The Rare Earth Roll Separator or Masteroll is the world’s most popular magnetic separator used by mineral processors to separate paramagnetic minerals from dry materials. 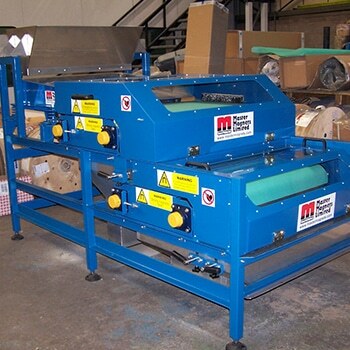 The Rare Earth Roll Separator is simple to install and use, whilst being exceptionally energy-efficient. The high-intensity magnetic strength enables the separation of very weakly magnetic minerals such as mica (biotite and muscovite). The high intensity magnetic fields are generated using Neodymium Iron Boron permanent magnets, otherwise known as Rare Earth Magnets. The Rare Earth Roll Separator is used to separate weakly or para magnetic minerals from non-magnetic minerals in a dry state. These non-metallic minerals are widely used in the production of ceramics, plastics, glass, cosmetics, paper, and many other commonly used materials. Typical minerals being processed include feldspar and silica sand. In our latest video, Dr Neil Rowson, a respected mineral processing engineer from the University of Birmingham, presents a technical video explanation of the Rare Earth Roll Separator. In our video, Dr Rowson explains how the untreated non-metallic mineral material is fed from a hopper or vibratory feeder at a controlled rate onto a short conveyor. The mono-layer of material is carried onto a high intensity permanent magnetic head roll. Magnetic material is attracted to the magnetic field of the roll. This attraction changes the trajectory of the magnetically attracted minerals away from that of the non-magnetic material. A splitter plate is positioned between the two different trajectories, enabling a split of the two materials and separation of the weakly and para-magnetic minerals. The separation is continuous and requires limited supervision. Rare Earth Roll Separators are often supplied as multi-stage systems with materials (feed or separated magnetics) being retreated. The video shows Dr Rowson undertaking test work at the Master Magnets laboratory in Redditch, UK. Tests are conducted on mineral materials from deposits all over the world. From the tests it is possible to confirm what separation is possible on what equipment. This then forms the basis of a separation guarantee for any equipment order. The Master Magnets laboratory houses one of the most extensive ranges of high intensity magnetic separation equipment in the world.